For the “first time I feel optimistic while following these talks,” one observer says. Contrary to the past, hope for a peaceful settlement to end the 17-year-long anti-terror war in Afghanistan is high as the Taliban and the United States concluded their second round of direct talks in the United Arab Emirates on Tuesday. Optimism runs high not only among the key stakeholders – the Taliban, the United States, and the Afghan government – but also facilitators, including the UAE, Pakistan, and Saudi Arabia, as well as keen observers of the Afghan conflict. Earlier, Alice Wells, the U.S. principal deputy assistant secretary of state for South and Central Asia, had already held one such meeting with representatives of the Taliban’s Qatar office in July. The only unpleasant side of the fresh round of talks was the Taliban refusal, as before, to meet the Afghan government delegation. Afghanistan’s negotiating team was present in the UAE, expecting a change in Taliban behavior this time. The Taliban’s top demand during the meeting was withdrawal of the foreign troops, followed by the release of prisoners and removal of Taliban leadership names from the international sanctions list. 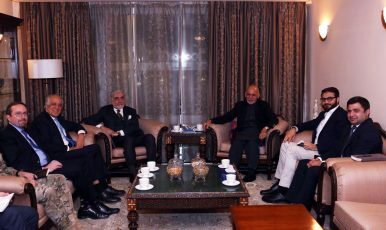 They believe this would pave the way for a limited ceasefire and their direct negotiations with the Afghan government. While reconciling the conditions and demands from either side still seems to be an uphill task, the atmosphere of goodwill generated through the involvement of the UAE, Saudi Arabia, and Pakistan as the key facilitators is providing enough room to achieve progress during or before the next round. This is the “first time I feel optimistic while following these talks,” says Sami Yousafzai, a freelance journalist with an extensive experience covering the Taliban insurgency in Afghanistan and Pakistan. Yousafzai says another reason for his optimism is the participation of senior Taliban representatives who are in direct contact with the Taliban chief Mullah Haibatullah Akhundzada. Besides, he added, key representatives of the Haqqani Network chief Sirajuddin Haqqani also participated in the recently concluded round of talks. Apart from the participation of the senior-level Taliban representatives, the coming forward of Saudi Arabia further increased pressure on Pakistan, which is believed to be the key supporter of the Taliban, to play a positive role this time. Pakistan is often accused of playing a double game by providing sanctuary to the Taliban on one hand and offering cooperation to the United States as its anti-terror ally on the other. Pakistani officials vehemently refute those charges by saying that the country has suffered huge human and material losses by partnering in the U.S.-led anti-terror war. Pakistan’s key concern is believed to be its arch-rival India, which has developed more goodwill among both common Afghans and the Kabul government since the overthrow of the Taliban regime in the aftermath of the 9/11 terrorist attacks. “Pakistan feels the pressure,” says Mohammad Tahir Khan, an Islamabad-based analyst who closely covers the Taliban and the Afghan conflict. Afghanistan is now the only point that keeps Pakistan attached to the United States. All other connections between the two countries have been severed. The U.S. State Department recently included Pakistan in its religious freedom blacklist. The country is already on the grey list of the Financial Action Task Force (FATF) for alleged terror financing. To escape international isolation, Pakistan needs to review its ties with its erstwhile ally the United States. In the past, Pakistan used to stress the need for peaceful solution to the Afghan conflict. Tahir Khan says now that the United States has launched efforts to put an end to the fighting through peace negotiations by directly engaging the Taliban, there is no other option for Pakistan but to cooperate and welcome the process. One of the United States’ smart moves this time was to engage Saudi Arabia and the UAE, Pakistan’s supporters and friends in the Arab world. This creates three-pronged pressure on Pakistan from the United States, the UAE, and Saudi Arabia. For the Taliban, too, there is no other option but to come to the negotiating table upon the urging of its well-wishers — Pakistan, Saudi Arabia, and the United Arab Emirates — in the region. The Taliban cultivated good relations with all the countries that had recognized their government soon after the militia took over Kabul in the mid-1990s. Besides Pakistan, the UAE, and Saudi Arabia, China is another country in the region believed have smooth relations with the Taliban. Although China is not an active partner in the UAE talks, it has never played the role of spoiler — despite its trade war with the United States. Only days before the UAE talks, the Chinese foreign minister held meetings with his Pakistani and Afghan counterparts in Kabul to discuss peace in Afghanistan. Analyst believe China needs Afghan peace more than anyone else because the success of its multibillion dollar China-Pakistan Economic Corridor (CPEC), part of its Belt and Road Initiative (BRI), is not possible without peace in the region. While the stakes are high, the pitfalls are deep. One of the key hurdles is perceived to be the Afghan government and Afghan leadership, which so far, has not issued any statement regarding the second round of talks. Unlike his predecessor Hamid Karzai, President Ashraf Ghani is not averse to the Taliban holding direct talks with the United States. But Ghani’s rivals may mount pressure on his government if the Taliban continues to refuse a meeting with Ghani’s representatives. After achieving progress in his meetings with the Taliban, Khalilzad’s next tricky job will be to pacify Ghani’s detractors besides keeping the Afghan president on his side. Khalilzad’s next move, as he rightly put it in a tweet, is to arrange an “intra-Afghan dialogue” to generate support for his talks with the Taliban. His meeting with Afghan civil society, youth and political party leaders, in this regard, will be highly productive. Only an all-encompassing process will provide a solid base for lasting peace and stability in Afghanistan. Taliban Declare Start of Spring Offensive Amid Talks With USWhy Is Zalmay Khalilzad Such a Controversial Figure in Afghanistan?US-Taliban Talks: What's on the Agenda in Doha?Agreeing to Agree: The Afghan Peace Process Sort of Moves ForwardWhat Might Lie Ahead for Afghanistan?